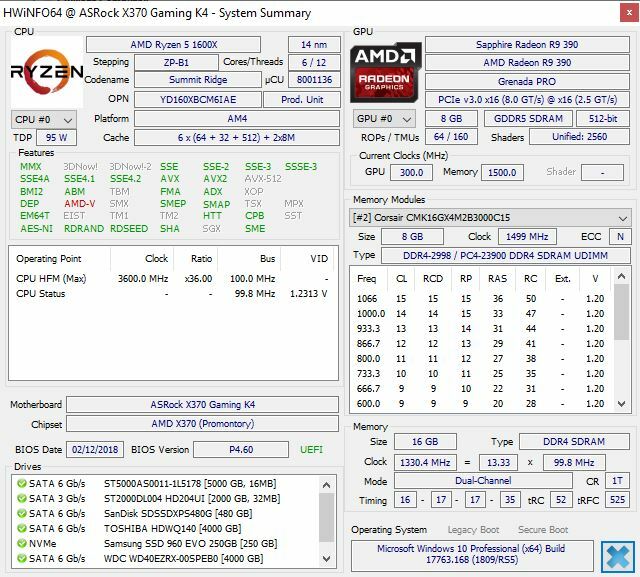 HWiNFO64 v6.04 mit AMD-Zen-2- und Navi-Support | Planet 3DNow! Full AMD Rade­on VII moni­to­ring sup­port. Added Intel Coo­per Lake and Snow Ridge. Impro­ved con­fi­gu­ra­ti­on of tray icons. Impro­ved sup­port of mul­ti­ple devices behind Intel VROC. Added moni­to­ring of Cor­sair Pla­ti­num series (H100i, H115i) coo­lers. Added repor­ting of TDC and EDC limits for AMD Zen CPUs. Impro­ved detec­tion of seri­al ports. Fixed repor­ting on sys­tem tem­pe­ra­tu­re on some MSI main­boards. Fixed occa­sio­nal 0 RPM fan values on some sys­tems with ITE SIOs. Added preli­mi­na­ry sup­port of Intel Emmits­burg. Added preli­mi­na­ry sup­port of AMD Navi. Added repor­ting of DIMM tem­pe­ra­tures via IMC on San­dy Bridge and later ser­ver CPUs. Minor impro­ve­ments to UI and bug fixes.